Your enquiry is about the wife of Vishwakarma also called as Tvaṣṭā (त्वष्टा). The puranas is giving us the name of wife of Vishwakarma. one prominent and definite among them is Virocanā (विरोचना). In Vayu Purana - Book 2 -Chapter 22 its mentioned that Virocanā was Praladas daughter and sister of Vairocana (son of Prahlada) was the wife of Tvashta , the next few shlokas also mention Surya getting married to Vishwakarma's daughter Samjana. .
19 Tvastrs wife was the famous daughter of Prahlada and the sister of Virocana and the mother of Trisiras. Here in above verse its mentioned that very clearly . 21 His younger sister , the daughter of Tvastr (originally) famous by the name of Surenu became the wife of the Sun and is well known as Samjhana. The above is also confirmed from Brahmanda Purana -Part 3 - Chapter 59 - Birth Of Vaivasvata - 2.3.59 . 19 Virocana , famous as the daughter of Prahlada was the wife of Tvastr . She was the sister of Virocana and mother of Trisiras. Srimad Bhagavata Purana - Skanda 5- Chapter 15- Verse 15 is also giving us the name of wife of Tvasta aka Vishwakarma as Virocana. Bhauvana begot a son named Tvashta. In the womb of his wife Virocana, Tvashta begot a son named Viraja. 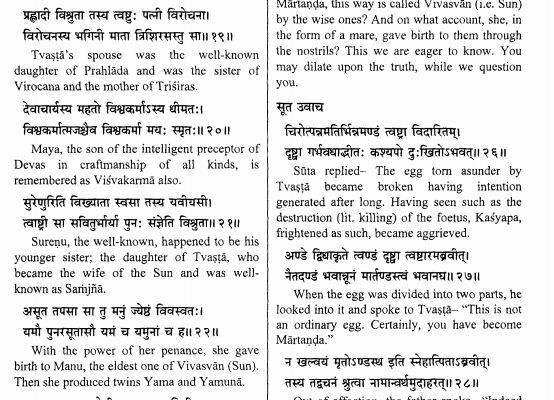 So from above three accounts we can say that Virocanā (विरोचना) was the wife of Tvashta , was the mother-in-law-of-surya. Also note that there are two similar english names here with same spelling but different pronunciations 1) Virochana (Sanskrit: विरोचन) and 2 ) Virocanā (विरोचना) ,sister of Virochana. Below is screenshot of Vayu purana verses. Well not really sure about the story but Viśvakarmā had a wife named Ākṛtī. From Āṅgirasī, the wife of the Vasu named Vāstu, was born the great architect Viśvakarmā. Viśvakarmā became the husband of Ākṛtī, from whom the Manu named Cākṣuṣa was born. The sons of Manu were known as the Viśvadevas and Sādhyas. Viśvakarmā (विश्वकर्मा).—A Prajāpati. His daughter Barhiṣmatī was the wife of Priyavrata.1 A son of Vāstu and Āngirasī; wife was Kṛti (Akṛti, Bhāgavata-purāṇa). Father of Manu Cākṣuṣa.2 The divine architect skilled in making weapons. Made vajra of Dadhīci's body and built Indra's abode and erected Sutalam.3 Fought with Maya in Devāsura war. Two more daughters of his were Samjñā and Chāyā who were married to the Sun god.4 Was ordered by Kṛṣṇa to build a city for the Pāṇḍavas;5 built Garuḍa's abode;6 an author on architecture;7 father of four sons; originator of all śilpas, arts and crafts;8 presented Śrī with jewels. Not the answer you're looking for? Browse other questions tagged mythology surya vishwakarma .